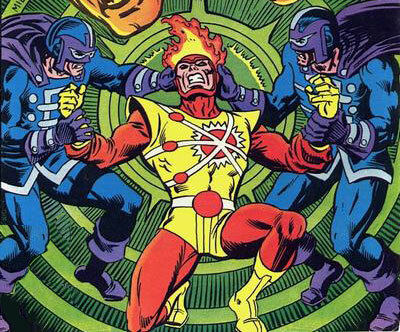 Today we’re featuring an unusual and hilarious item – a song about Firestorm the Nuclear Man! The SpinTunes blog started a song-writing competition back in June. The first round challenge was called, “I’m A Marvel, And I’m A DC”. Contestants had to write a song from the point-of-view of a superhero or supervillian. All of these song entries were then combined into a single 23-track album. Bryce Jensen wrote the comical song, Dearest Firestorm (Love, Multiplex). You should be able to play the song through the embedded player below. If you’re unable to use the embedded player below, please click here to visit the relevant SpinTunes page. Wasn’t that freakin’ hilarious! I received a quick note from the song writer wanting to reassure FIRESTORM FAN readers that this song was simply meant to be a bit of fun. It was not meant to mock or disrespect the characters or their fans at all. Fun stuff! Be sure to check them out! Posted in: Firestorm #01: Original (Ronnie/Martin), News, Professor Martin Stein, Ronnie Raymond. I’m not sure how I feel about this little diddy. It was mildly humorous in a “Harold & Kumar” sorta way. Funniest bit is at the end of the song … and me and me and me and me. Thanks for promoting Bryce’s song & the SpinTunes contest. I hope the Firestorm fans appreciate the hard work he put into the song.